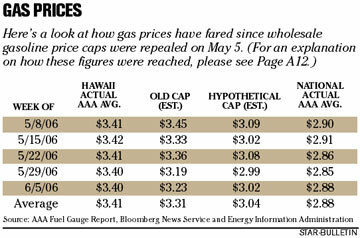 Gas prices Friday at Lex Brodie's station on Queen Street in Kakaako reflected the relative stability of prices since the cap was suspended May 5. In the month since the state's wholesale gasoline price cap law was suspended, Gloria Snyder hasn't noticed much change in the price of gas. "I think it's still about the same -- gas prices are still high," the 61-year-old Aliamanu resident said as she recently put $52 worth of midgrade gas into her Isuzu sport utility vehicle at Lex Brodie's in Kakaako. Just as when the price caps were in effect, the debate on whether they helped or hurt Hawaii consumers continues now that the regulations have been suspended. Without a mechanism to force prices down, it remains to be seen whether island pump prices will retreat on their own. A Star-Bulletin analysis indicates that Hawaii motorists could have saved an average of 10 cents a gallon on regular gasoline in the past month if the state's wholesale gasoline price cap law had remained in place. Instead of rising and falling with mainland markets as they had under the price caps -- with sharp week-to-week changes of more than a dime in many cases -- Hawaii prices have remained fairly consistent since Gov. Linda Lingle signed the legislation to suspend the caps on May 5. 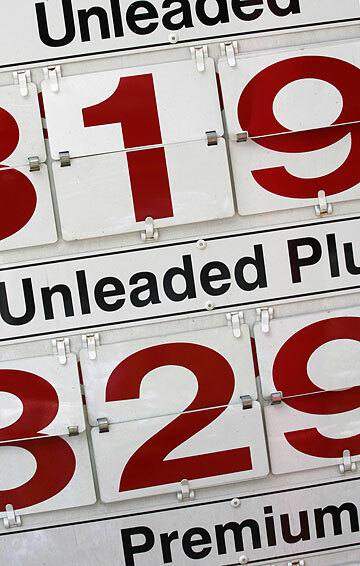 Since then, the daily statewide average as reported by AAA's Fuel Gauge Report has ranged from $3.38 to $3.43 a gallon, with the average settling at $3.41. 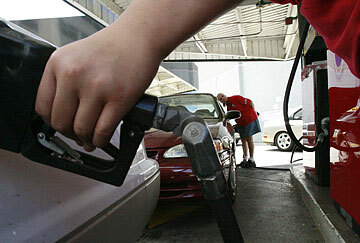 The national average over the same time has been about $2.88 a gallon. Under the old price cap formula, the statewide average over the past month could have been about $3.31 a gallon. A proposed new formula, included in the law that suspended the caps, could have forced the average 27 cents lower than that. For supporters of the now-defunct caps, such numbers are not surprising. "I think what's been happening demonstrates that our gas pricing law had been working previously," said Senate Consumer Protection Chairman Ron Menor, the chief author of the original law. "I anticipated that with the suspension of our gas pricing regulation that the oil companies would return to their old pricing practices of keeping prices high even as mainland prices were falling," he added. "There's no question that our prices would've been lower." Although Menor remained a staunch supporter of the legislation this year, late in the session he offered a proposal to suspend the caps as a compromise to House members, who strongly pushed for an outright repeal of the law. The compromise gave the governor the authority to reinstate the caps if it is determined that high prices are having a detrimental effect on consumers, although Lingle has said she is unlikely to bring them back. The new law also enhances penalties for price gouging and anti-competitive practices and sets up new oversight standards aimed at making more pricing information public. Opponents and critics of price regulation say Hawaii prices now reflect supply and demand market conditions, noting the wide variety of prices that still remains throughout the islands. On Friday, for example, pump prices on Oahu ranged from $3.09 to $3.19 a gallon, respectively, at Costco and Lex Brodie's, and from $3.41 to $3.34 a gallon at stations in town, by the airport and near Kahala Mall, according to Honolulugasprices.com, a Web site that lets the public post gas prices online. "With the suspension of the price cap, it really has reverted back to a free market system at the retail and wholesale levels," said Nathan Hokama, a spokesman for Tesoro Hawaii Corp. "Retail prices are determined by competition within neighborhoods." Tesoro and Chevron USA Inc. operate the state's two oil refineries. The companies do not disclose pricing information for competitive reasons, but both say the market in Hawaii has adjusted to the absence of the cap. "Post-price cap, we're just really trying to be competitive," said Alice Potter, retail sales manager for Chevron in Hawaii. "We are pricing with the market and market drivers will set the price. "The retailers are all independent business owners and they price on the street," she added. "Chevron does not tell them how to price. What we do is give them a competitive supply price." Oil industry critics, who have consistently cited past statements by the companies acknowledging the lack of a true market in Hawaii, remain unconvinced that prices will go back down without a mechanism such as the price cap. "When you have an oligopoly and a lack of competition, there's very little pressure for the price to go down," said Tim Hamilton, a mainland oil industry analyst who assisted Menor in the development of the price cap law. "I think it'll stay this way unless the governor decides to roll the prices back. "The fear that oil companies would go up and stay up and create an artificially high price and a new standard of a high price is realized. They did exactly that." John Felmy, an economist and director of the American Petroleum Institute, noted that crude oil -- the biggest cost component of gasoline -- is still trading at or above $70 a barrel. With the potential for continued political unrest in oil-producing regions such as Iran and Nigeria, the upcoming summer driving season, the start of hurricane season and continued adjustment in the amount of oil reserves, Felmy said it is too early to say what will happen to the price of crude oil, and in turn, gasoline. "In terms of the overall crude situation it depends really on what will happen with all the supply factors around the world," Felmy said. "It's a pretty cloudy crystal ball." In Hawaii, both supporters and opponents of the gas cap say it is incumbent upon the Lingle administration and the Public Utilities Commission to enact and enforce the oversight provisions set forth in the new law. "There's no reason why they can't move forward," said Menor. Rep. Kirk Caldwell, one of the strongest supporters of the gas cap's repeal in the House, said the transparency measures will give lawmakers and the public the information needed to determine the next course of action. "Once they start to gather the information we can begin to see what the problem is," said Caldwell (D, Manoa). "The gas cap, in my mind, was the solution before knowing what the problem was. "This (law) is about determining what the problem is and then coming up with a solution." Lisa Kikuta, chief researcher at the Public Utilities Commission, said there is no timetable yet on when the agency will have the measures in place, noting that the act appropriated only $1 to the PUC to implement the transparency provisions. She said the agency is evaluating how it might be able to secure additional resources, "but that still is in the early stages." If necessary, the agency could come back to the Legislature next year to seek additional funding or positions. Meanwhile, motorists like 20-year-old Tammy Kornegay of Waipahu will continue shopping around. "It's hard to say $3.19 a gallon is cheap, but right now, it is," she said, as she recently put $20 of regular in her Honda sedan at Lex Brodie's. "I remember when it was less than $3. "Before, I used to only put Chevron, because that was the best gas. Now, I always come here because it's cheap." Motorists lined up for fuel Friday at Lex Brodie's gas station on Queen Street in Kakaako. Pictured is service attendant Mary Fernendez. Averages of statistics are based on information from the AAA Fuel Gauge Report collected by the Department of Business, Economic Development and Tourism. Old cap estimates were calculated using the formula that was in place from Sept. 1, 2005, through May 5, using data from Bloomberg News Service. Hypothetical caps were calculated using the formula passed by the Legislature contained in Act 78, using data from the U.S. Energy Information Administration. Estimates assume wholesalers charged up to the maximum allowed and dealers added a markup of 16 cents.